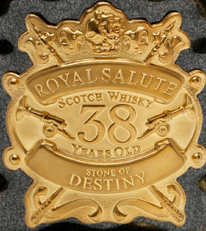 Royal Salute 38 Years Old Stone of Destiny is presented in a distinctive porcelain granite-effect flagon, crafted by Revol in France. Such an evocatively elemental setting is enhanced by a hand-crafted 24 carat gold plated crest commemorating the arms of Scottish brave-hearted warriors. This martial motif is then carried through to the 24 carat gold-plated stopper inspired by the hilt of the ancient two handed Scottish broadsword, the Claymore. Crafted from whiskies aged for no less than 38 years, this unique blend shares its name with the Stone of Destiny, that legendary and enigmatic Coronation stone of the ancient Scottish Kings. Some even say it is the Stone of Jacob, referred to in Old Testament Book of Genesis. The Scots certainly hold it in reverent awe and were jubilant in 1996 when, after many battles and exactly 700 years in English hands, it was finally returned to its homeland, Scotland. It was last used in Westminster Abbey at the Coronation of HM Queen Elizabeth II, and now rests in Edinburgh Castle alongside the Honours of Scotland, the Scottish Crown Jewels.